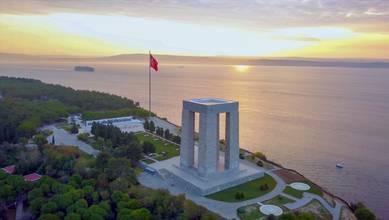 Top contributor jesus_tr created this moving aerial video to the monuments commemorating the World War I Battle of Gallipoli. The battle was joined in March, 1915 with an Allied naval bombardment of the Dardanelles Strait followed by landings on the Gallipoli Peninsula, in an attempt to knock Turkey out of the war. The invading forces were not able to take the commanding heights above the beaches, where Turkish forces under future leader Kemal Ataturk held fast over months of attacks. Description: Peace at home, peace in the world. Mustafa Kemal ATATÜRK Those heroes that shed their blood and lost their lives ... You are now lying in the soil of a friendly country. Therefore rest in peace. There is no difference between the Johnnies and the Mehmets to us where they lie side by side here in this country of ours ... You, the mothers who sent their sons from faraway countries, wipe away your tears; your sons are now lying in our bosom and are in peace. After having lost their lives on this land they have become our sons as well. These famous, heart-rending words, attributed to Mustafa Kemal Ataturk, who was a commander of Ottoman forces at the Dardenelles during the first world war and later the founder of modern Turkey, grace memorials on three continents, including at Anzac Cove, Gallipoli. A procession of Australian prime ministers, from Bob Hawke to Kevin Rudd to Tony Abbott, have spoken them to invoke a supposedly special bond between Australia and Turkey forged amid the slaughter of the 1915 Gallipoli campaign in which some 8,700 Australian and more than 80,000 Ottoman troops died. As Australia prepares to commemorate the centenary of the British invasion of Gallipoli on 25 April, the authenticity of these emotive words, supposedly uttered in 1934 and interpreted in Australia as a heartfelt consolation to grieving Anzac mothers, are being challenged with assertions that there is no credible definitive evidence Ataturk ever wrote or spoke them.